Everyone is talking about how simple mat pilates exercises are when it comes to toning up at home. Step by step illustrated example of how to do mat pilates. Is mat Pilates a good workout for women? With mat Pilates at home exercising is easy! - Here is a Pilates beginning mat workout to try out helping you slim down your waist without leaving your house. Mat Pilates Exercises allow you to slim your waist, tone your arms, and even reduce back flab at home. 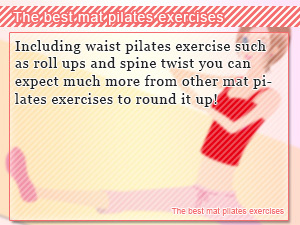 What you will find out is that advanced Pilates mat exercises differ little in from intermediate and beginner workouts. The key is to continue to practice Pilates. In this diet Slism for exercise, we will introduce some mat Pilates exercise to do at home for women looking to tone up without leaving the living room. Pilates as an exercise comes in second to none especially when it comes to tailoring to women's weight loss needs such as tone arms, gaining flexibility throughout the body, and sculpting a beautiful body line. There are many Benefits of Pilates Exercise in weight loss such as training inner muscle and relieving built up stress among many other benefits you get from exercising regularly. Exercises for women at home such as mat pilates to loosen up your shoulders and yoga make a great addition to your workout routine when you are not able to make it to the gym or just want to relax at home not having to worry about what other people are doing. When you are not really up for going to the gym then at-home exercise for women may be your best bet on getting the exercise you need to stay fit. Similar to yoga exercise Pilates exercise can be broken down into poses and their movements. It can be also be broken for added value in simplicity into the required equipment needed to perform the exercise prescribed by its methods. For example, some exercises can be done using only a mat or done on the bare floor if you don't mind. That's mat Pilates. Mat Pilates is one of those exercises to do at home that never gets old because there are so many different kinds of exercises out there targeting areas of your body such as hard to reach upper arms and lower back. Mat Pilates upper arm exercise for women helps you get rid of flabby arms doing Pilates at home without leaving your living room. Where mat Pilates makes it easy to break into Pilates on the floor, chair Pilates makes it just as simple using any chair you have at home, around the house, or wherever you choose to get your Pilates on. Chair Pilates is good for exercising with Pilates at home and even at work. Although, it comes with a different fitness landscape than mat Pilates, you can expect it to pull its weight in your weight loss routine. Pilates exercises using a mat require the no special equipment which makes it perfect for use around the house. Given that you've already got mastered proper breathing techniques for doing pilates, Mat pilates is a safe exercise for women, whether you are just getting started out exercise or are just looking for something new to add to your fitness routine. What are some good exercises to tone up your stomach with mat Pilates? In addition to helping you tone your stomach, Pilates mat exercises give you to what you need to shape up your hips, relax a little, and reshape your legs. Here are two mat pilates exercise you can use to slim your waist toning your stomach helping your get the flat belly abs you've always wanted in only minutes a day. Lay flat on your back with knees off the floor. The following exercise is called the roll up. In this exercise you will be rising to a sitting position just as you would do attempting to do a sit up. For this reason Pilates roll ups are sometime called Pilates situps. Doing this exercise combined with other mat Pilates exercises we will introduce later will help slim your waist giving your stomach the definite tone you can take to the beach. Facing up with your shoulders pinned to the floor and knees slightly bent, place your hands on top of your stomach around you lower abdomen. Note that your feet should be pressed flat against the surface of the floor. While exhaling rise to a sitting position without having your feet come off the floor. Try to bring your arms to your knees while imaging a deep breath of air leaving your body tightening your stomach. While inhaling return to position 1 bring your shoulders back to the floor placing your hands on your lower abdomen. For best results in toning up your stomach, do 8 Pilates Roll Ups while focusing on good form tightening your stomach. In this next exercise we are going to be doing a Pilates exercise called the spine twist. All you have to do is focus on twisting your spine exercising your waist into shape. When doing spine twist it is common to twist your whole upper body. For best results, you want to isolate your spine while you twist. How you isolate you upper body while doing the spine twist is greatly affecting by your posture. That is why when doing this exercise, in addition to twisting you spine you, special focus on executing each movement without losing your posture is recommended. [Exhale] While keeping your hands in front of your chest exhale as your twist your body slowly to your right not forgetting to breath. To prevent your form from crumbling make sure to keep your legs evenly spaced apart evenly distributing your body weight. [Inhale] Inhaling return your torso back to its original position centered between your legs facing forward. [Exhale] Twist body to the left this time performing the same movements as the previous step only this time on the other side. [Inhale] Restore body back to center. That is 1 set. For results you can see toning your stomach, do 3 Set of the Pilates Spine Twist while focusing on good form tightening your stomach. Including waist pilates exercise such as roll ups and spine twist you can expect much more from other mat pilates exercises to round it up! Exercising at home is priceless! 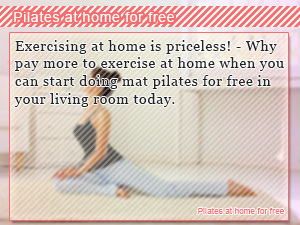 - Why pay more to exercise at home when you can start doing mat pilates for free in your living room today. For women looking to tone up body exercising mat pilates makes a great addition to any fitness routine for ladies trying to lose weight.